Approximately 90% of the homes in the US use this configuration. 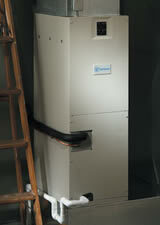 “Split” simply means that your equipment is split into two main components: indoor and outdoor. 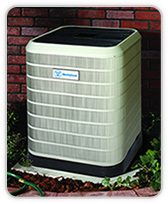 The outdoor section is variously referred to as a condenser, condensing unit, or simply the outdoor unit. The indoor section is also called an air handler, (all electric), furnace, (typically gas or oil), or, simply the indoor unit. 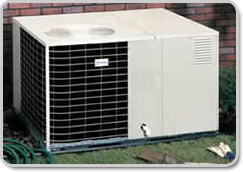 If you have an air conditioner unit outside your home and an indoor unit (typically in a closet, garage space, or attic with ducting attached to it), then you have split system. 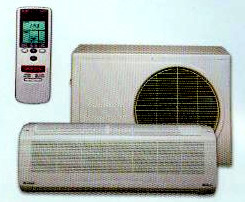 These are not referred to as central air conditioners and are normally used in single-room applications such as porch enclosures, bonus rooms, music studios, etc. This is technically a split system with a wall hung indoor unit connected to an outdoor section via refrigerant lines routed through a 3 inch hole in the wall. Multiple ductless type systems can be purchased to provide whole-house cooling where ductwork is costly, impossible, or prohibitive.